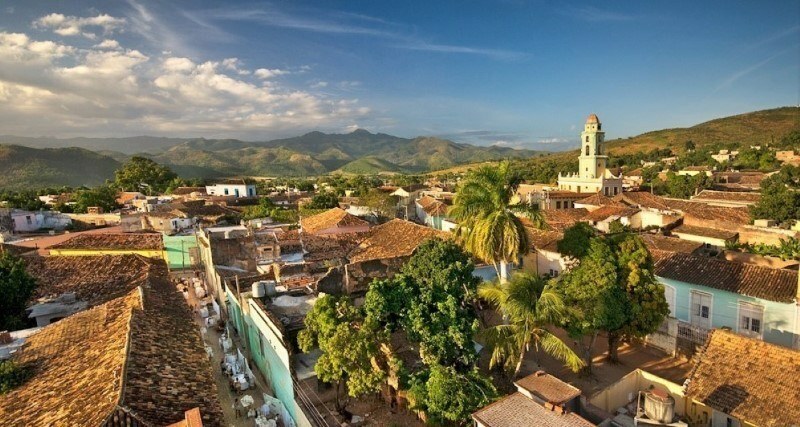 Trinidad is a very popular destination for people visiting Cuba. It is one of the most popular Havana excursion packages, sold by many travel companies. If you are visiting Cuba, and planning to stay in Havana, you can easily get to Trinidad and explore this beautiful, old city. In order to get from Havana to Trinidad you will have to drive through the countryside. This is an amazing experience. You will see fields and old farms. It’s a stunning view. Many tobacco farms line the route. You can easily take the Viazul bus service, which operates daily routes from Havana to Trinidad. If you book ahead of time, you will have no problem getting a seat. You can even reserve your seat in advance, online at www.Viazul.com. The Viazul bus terminal in Havana is located at the corner of Ave de La Independencia and Calle 19 de Mayo (near the Plaza de la Revolucion) in the Vedado neighborhood. You can also go there to book your tickets. The only slight inconvenience with the Viazul bus is that if you see something interesting on the road, you can’t actually stop to take a look at it. For this reason, I have had some clients who take a private taxi during their expeditions into the countryside, and they were very happy. Hiring a private taxi to get you from Havana to Trinidad is definitely more expensive than taking the bus, but you get to set your own schedule and experience more of Cuba. If budget is not a major factor for you, then you might want to look into this option. The easiest and fastest way to get from Havana to Trinidad is to use a taxi. In the Taxis section of this website you will see several taxi options which we offer to take you to Trinidad and all around Cuba. We offer classic American car taxis, modern air conditioned taxi cars and minibus taxis for larger groups. Check out the link and reserve you taxi in Cuba today. I have built some relations with a good group of casas particulares in Trinidad. If you are looking to book a reservation for a casa particular in Trinidad, you check out the following link and click on the “Trinidad” link in the search menu. There is a good selection of casas at very affordable prices, and you can contact the casas directly to make your reservations online. I will also note that you can easily find a casa in Trinidad when you arrive, and there is no real reason to make an advanced reservation. There is very little tourism outside of Havana and the casa owners in small cities like Trinidad are usually desperate for clients. 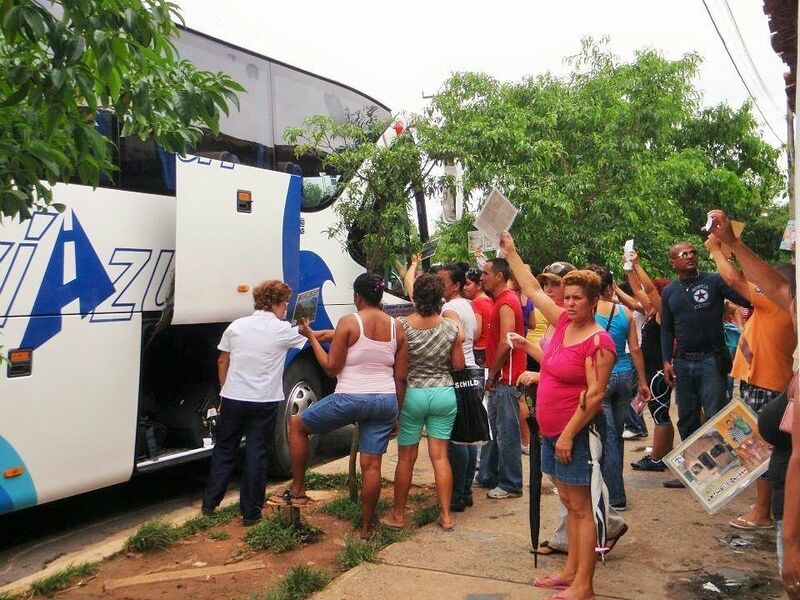 Locals waiting at the Viazul bus terminal to offer their casas particulares, as foreigners get off the bus. If you are just traveling with a small backpack, you can easily walk for 5 minutes in Trinidad and get a great room. In many cases, groups of landlords with casas particulares available will be waiting for foreigners at the entrance to the city, especially around the Viazul bus terminal, eager to offer their casas at discount rates. I have often been offered casas for 15$ or less, per night, in these situations. Once you are in Trinidad, you can explore the whole city in day or two, and it’s beautiful. It’s such a small place that you wouldn’t really require a guidebook. After reading the Real Havana guide and learning the basics of Cuba culture, you will have more than enough knowledge to explore Trinidad on your own and find interesting, local places to have fun. The whole city of Trinidad is smaller than the single neighborhood of Old Havana, so, really, you will not have any trouble navigating around the area or finding fun things to do. As a suggestion, in Trinidad, you can check out the city, walk along the old street, pop into some vintage shops, go to the Casa de la Musica, dance and have fun, or if you like nature, go to the Topes de Collante natural park where there are rivers and hills. It is typical to spend 2 to 3 nights in Trinidad. Not more. There is also the large city of Cienfuegos very close-by. So, if you grow bored of Trinidad, it could be a nice change just to hop over to Cienfuegos for an afternoon or a night. You can easily find a private taxi in Trinidad to take you to Cienfuegos for about 20$ per carload. There are also some communal taxi services (found around the Viazul terminal in Trinidad) which can take you to Cienfuegos for about 1$ per person. Trinidad is a small city, filled with old world charm and wonder. It is located close to Havana and easy to get to by taking the Viazul bus, or hiring a private taxi. The ride from Havana to Trinidad is an amazing, scenic experience. If you are dreaming about seeing the real, Cuban countryside, and passing tobacco and sugar cane fields, then you will love it. Once in Trinidad, it is usually very easy to find a casa particular. Just walk around the city a bit and you will see dozens of casas with vacancies and if you drop by the Viazul terminal, there will be locals offering their vacant casas at discount prices. This is one of the great things about traveling to small cities in Cuba; tourism is low and you can easily find accommodations without much planning. And, if you get bored of Trinidad, the large city of Cienfuegos is not far away, so you can always get a taxi to bring you there for a day trip.